Via: huffingtonpost.co.uk: Michael C Hall reveals how it feels to play America’s favourite serial killer and what the future holds after the final season airs next year…. Dexter has very dark relationships with people – do you have any strategies for coping with the storylines and keeping them from seeping into your private life? Did you have concerns about playing a serial killer and how that might translate in a wider context? How do you feel the character has changed over the seasons? There’s a growing trend towards anti-heroes on television what are your views on that? I think people respond to a character where the dark corners are revealed and unveiled. It’s complicated, a sense that people are identifying with or sympathising with, even rooting for a character with pretty significant skeletons in their closet. But you know I think we all have those, maybe not like Dexter’s or Tony Soprano’s, but we understand the concept and that’s part of the appeal. Do you find people treat you differently since you started playing a cold-hearted serial killer? Sometimes people talk to me and I’ll just look at them and they say ‘you’re doing it, you’re doing it, you’re Dexter right now – you’re giving me the Dexter look’ And I’m like ‘No’ [He gives his best Dexter stare] But it’s very gratifying… for the most part when people say anything it’s just to say that they love the show and want to know when it’s coming back on. 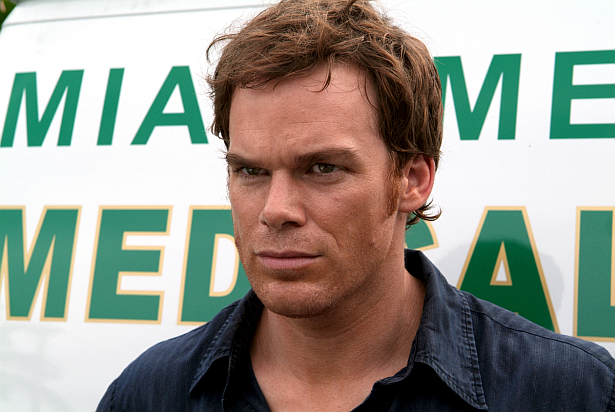 What will you miss least about Dexter when it ends? Putting on the kill suit…it’s a real process. And driving to Long Beach at 5.30 in the morning is hard sometimes. But there’s a lot more that I’ll miss than not miss. For a television show to work it requires so many people to do their jobs well and I’ll miss going to work at a place where everybody truly has a sense of ownership and investment, a collective sense of focus and shared purpose. Hopefully I’ll find it somewhere else but this is a unique creative family. Has your battle with cancer changed you as a person? Yes and no. I was very fortunate to have discovered my Hodgkin’s lymphoma at a very early stage and at a time when I was on hiatus from work. I had the luxury to really commit to my treatment and good health insurance and that made things a lot easier. It’s probably changed my appreciation of all those realities and my sensitivity to the plight of people who don’t have those luxuries. There’s a lot of cancer in my family, people who’ve gone through it, survived it, died from it. Going through that experience maybe helped me feel closer to some of them but the experience continues to unfold…I still think about it three years since remission. You were married to Jennifer Carpenter (who plays Dexter’s sister Deb) and have since divorced. How did you manage to make your on-screen relationship work in the aftermath of the split? We’ve been through quite a journey personally but thankfully there’s a fundamental friendship and respect…I think it’s a testament to our individual and collective commitment to the show, the characters and work generally. Plus we’re both just so enthused by the storylines for season seven [the season currently airing in the US] to play those scenes has really been something we’ve relished. The end of the show is in sight now (the eighth and final season will air in 2013) what happens next? I look forward to finding out. I couldn’t have imagined 'Dexter' when 'Six Feet Under' was coming to an end so I’d like to hope there are things on the horizon I can’t imagine at this moment. I did a movie last hiatus called 'Kill Your Darlings' [laughs] I know right, and the first image of the movie is my character dead. So I was like, yes, I’m really turning the tables on myself, I am the dead body. But as to the future I don’t really know what I’m going to do…. maybe take up strawberry farming, something like that.